I don't care what Punxsutawney Phil says, I'm ready for spring! 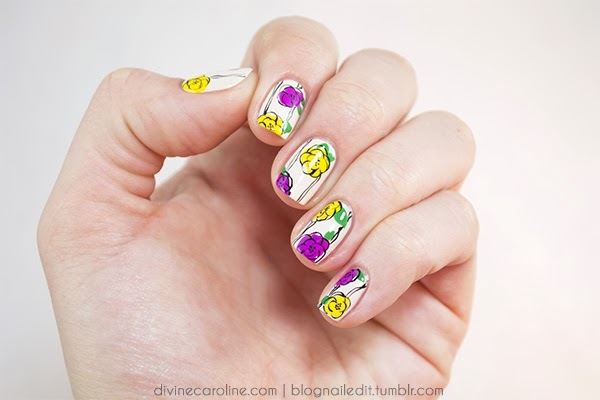 Ring in the warm weather with bright spring nails in my latest tutorial for freehand florals for Divine Caroline. Pop over to Divine Caroline for my guest post, Freehand Fun: Floral Nail Art for Spring and get the full tutorial. So delicate - love it! I ended up here from a link on Let Them Have Polish... I have to say I think the original is best! :) I haven't really tried much freehand art but floral is on my to-do list. In fact I went to Ulta on my way home from work today to pick up Posh by Revlon because I have no greens, and how can you do leaves without green!?! Of course I also ended up with two other greens but St Patty's day is coming up so I figured they'd come in handy!